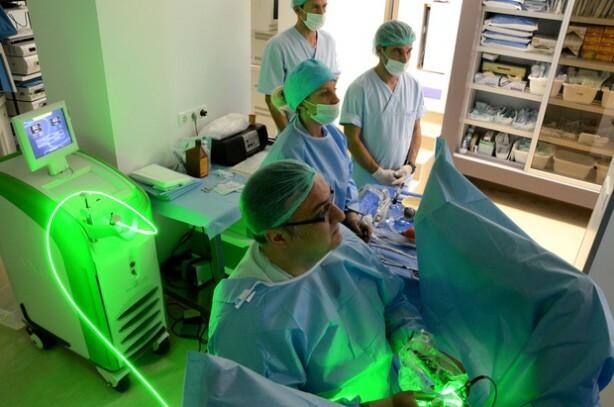 In December the Spanish specialist applied the new enucleation technique with the GreenLight Laser developed by him in Hill Clinic. The most significant urological forum in 2009 was held in 01-05 November in Shanghai, China. One of the most attractive presentations was an operation with the GreenLight Laser for prostate removal and was live broadcasted. It was done by Doctor Fernando Gomez Sancha – a leading expert in the International Group of Laser Users (IGLU). He pointed out the advantages of this method compared to the classic operation because it is bloodless, safe and there is no need of hospitalization. The light beams of the GreenLight laser do not harm surrounding tissue and organs. Doctor Fernando Sancha presented for the first time a new enucleation technique with the GreenLight laser developed by him, thus complementing the possibilities of this unique method for all prostate volumes. This method was applied in Hill Clinic in December 2008 in two cases of very large prostate volume of 250ml that are considered not possible for operation via classical methods. We are proud to state that Hill Clinic works with the most safe and modern methods in operative urology that were presented at the congress by the leading professors and specialist – slings, bladder stones laser removal, GreenLight laser.